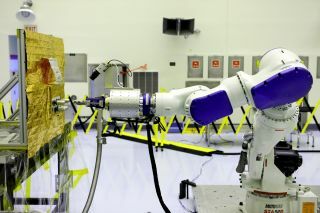 The Remote Robotic Oxidizer Transfer Test (RROxiTT) robot demonstrated a way for future servicing satellites to transfer oxidizer to a satellite in need of refueling, at the Kennedy Space Center's Payload Hazardous Servicing Facility. NASA wants to create a robotic gas station in space. While that might call to mind visions of interstellar starships, the unmanned depot won't actually be used to refuel rockets leading to the outer solar system or other worlds. Instead, it will service satellites orbiting Earth. NASA's Satellite Servicing Capabilities Office at Goddard Space Flight Center in Maryland teamed with the Kennedy Space Center (in Florida) in 2011 to concoct a way to refuel satellites as they zip around the planet. Under their solution, this refueling will be carried out robotically. By creating this new technology, "NASA hopes to add precious years of functional life to satellites and expand options for operators who face unexpected emergencies, tougher economic demands and aging fleets," NASA's Bob Granath wrote in a statement. This robotic technology is not limited to fueling, though. NASA can also use it to fix malfunctioning satellites and build entirely new structures in outer space. The partnership between Goddard and Kennedy has been fruitful thanks to each organization's special capabilities. Kennedy's long history of preparing spacecraft for launch, for instance, meant that it had a lot of experience with loading propellant. In addition, because of Kennedy's involvement, "project participants were able to use existing equipment, facilities and excess Space Shuttle Program hardware, saving millions of dollars in development costs," NASA said. One beneficial side effect of refueling satellites in orbit is that it lessens the amount of dangerous space junk in the area just above Earth's atmosphere. Instead of having dead satellites floating around uncontrolled, engineers on the ground can extend their lives with refueling, putting off costly launches and slowing the rate of material sent into space. At the geosynchronous orbit level, a region 22,236 miles (35,786 km) above Earth, there are more than 100 government-owned spacecraft and 360 "commercial communication satellites." Therefore, "the capability to refuel and repair satellites at this orbit could make GEO [geosynchronous Earth orbit] more sustainable and help mitigate orbital debris problems," officials with NASA's Satellite Servicing Capabilities Office wrote on their website.